A biography of part of Luigi Galleani's life. If an Anarchist movement exists today among the Italian immigrants and if such a movement has suffered practically no desertions as a consequence of the Bolshevik incarnation of Socialism, it is due to a large extent to the teachings and example of Luigi Galleani. Others and foremost Italian apostles of Anarchism have been in this country: F. S. Merlino, the pioneer; Pietro Gori, the poet, Errico Malatesta, Guiseppe Ciancabilla, impressing characters all of them, clear minds and pure consciences. But their activity here, however intense, was more or less of a short duration. Galleani's on the contrary, spread over most of twenty years and was marked by the continuous progress of his mind and of the revolutionary movement as well. When he landed on these shores, in the fall of 1901, shortly after Czologosz' execution of president McKinley, Luigi Galleani was in the prime of his life. Ten of his forty years of age he had continuously spent either in jail, in relegation or in exile. His mind had matured through a very thorough education, hard thinking and personal experience. His conscience was clean of opportunistic entanglements. His convictions were deep rooted. Persecutions had steeled him beyond fear and temptation. He had chosen his place in life, and nothing was to lure him away from his purpose. In 1898 he was confined to the Island of Pantelleria, when the socialist politicians, who had been intriguing with all sorts of reactionary tools, conceived their idea of subduing the Anarchists to their parliamentarian policy. All Italian Anarchists were then either confined to the islands or exiled. Had they consented to give their names to a political campaign and had they been elected, which was all but impossible then, in many cases, they would have been automatically set free. Galleani answered to the socialist manoeuvre for all his comrades in seclusion, saying that prisons, chains and persecutions had not daunted their faith and that, no matter how painful they found it to be severed from the living world, they would rather stay and die, if need be, on the Mediterranean rocks, then lend their names to an electoral circus, which they despised, bow to a flag which was not theirs. “Manet Immota Fides” - he wrote then on his flag, and his faith remained absolutely unchanged to his death. Of course, although they were absolutely truthful when they said nothing in the world could persuade them to repudiate or soften their Anarchist convictions, neither Galleani nor his comrades expected to die on the Mediterranean rocks. Errico Malatesta had escaped from the Island of Ustica a few months before, Galleani escaped from the Island of Pantelleria a few months later, and all were set free after Bresci's execution of King Humbert, in 1900. Following his escape from Pantelleria, Galleani spent some time in Egypt and then, by way of London, came to America. A deep knowledge of the Anarchist philosophy, twenty years of experience at the front of the social war, the firm conviction that the social revolution is at one and the same time what the people want and what they must have if human progress is to continue and civilisation to survive, a powerful mind, a noble character that feared nothing and disdained all compromise, a masterly pen with a touch of classicism, a native and carefully cultivated talent of oratory, which made him an unsurpassed tribune of the people - these were his arms as he plunged himself in the vortex of American life, in the wake of the plutocratic imperialism that was being fostered by the elder Roosveltian windbag. Galleani was not assimilated by the American environment. His age was too advanced to permit him to master the English language to his own satisfaction. And you cannot reach a people whose language you don't know perfectly. Besides, he was too much of an artist, too much of a scrupulous thinker to suffer himself to express his thoughts in less than a masterly way. For this reason, his passage through the American scene remains practically unknown to all but the Italo-American community and to the native police records. But even though he was not absorbed by the American environment, he certainly had a good grasp of its workings. Holding himself consistently aloof from the ruling cliques and from those who aspire to rule as well he could see the American panorama - its past, its present, its tendencies, from the point of view of the underdog - and accordingly elaborate his policies, his doctrine and attitude in a state of absolute independence. His first stop was in Paterson, N.J., then at its peak as the “hotbed” of Anarchism. Here he became the editor of a weekly paper called La Questione Sociale. When the famous textile strike of 1902 broke out, Galleani had the first opportunity to give the measure of himself as an agitator and a fighter. Nothing half-baked in him. If his written word might sound fiery to the mill czars, his spoken word rang as the hymn of resurrection to the hungry strikers. And his actions made good both. He was not an organiser. He called the workers to action for their bread, for their freedom - not for his own good. When the fight was on, he would ask the workers to keep it on, to rely on themselves, on their united effort to force the enemy into submission. He would not ask them to confide their troubles to his ability as a fixer or a mediator. For himself he would ask neither position, nor money, nor even the acceptance of his philosophy - only to let him fight by their side for the triumph of their cause. This kind of leadership is not familiar with the professional organisers of labour who are wont to approach the strikers with condescension with the more or less tacit understanding that they shall organise under their banners and make a position for them as their paid leader. When, if ever, these organisers take to picketing, they do it for advertising purposes and only provided they are accompanied by the elaborate paraphernalia of loud drums, reel photographers, news reporters, defence counsel and other similar accompaniments. Galleani's was the kind of leadership that marks the crusader and scares the job-seekers. On June 18th, while leading picketing strikers, they came into contact with the gunmen of the police force. They fought valiantly. Galleani barely escaped with his life after having received a slash on his forehead and a gun shot on his upper lip. The Paterson police were in an uproar to capture him. But he succeeded in escaping and took refuge in Canada from where he came to Barre, Vt., the following year, under an assumed name. There he founded a weekly paper of Anarchist propaganda called Cronaca Sovversiva, which was later transferred to Lynn, Mass. 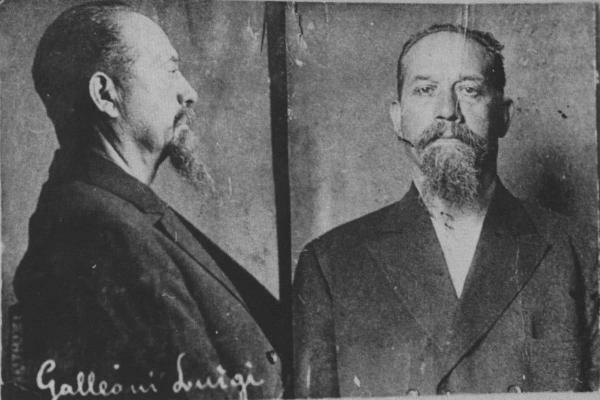 His identity having been publicly revealed by a socialist politician, G. M. Serrati, who lived to succeed Mussolini as editor of the official organ of the Italian revolution of 1919 - Luigi Galleani was arrested in Barre, Vt., on December 30th, 1906, extradited to New Jersey, and tried in Paterson a few months later for his part in the strike of 1902. His case was afterwards dropped following a disagreement of the jury. From 1903 to 1918 Galleani edited Cronaca Sovversiva, a paper which was a constant source of information, enthusiasm, courage and discussion. Into it Galleani transfused his wide knowledge and rare ability. He made it the mirror of his soul, which was itself the mirror of the anguish, torture and hopes of the underdog. For fifteen years this paper had an undisputed influence, not only over the Anarchist movement, but also over the whole revolutionary movement of the Italian community in America. It inspired a movement which was not probably very large in number but was highly select. Its members had a precise notion of what Anarchism should be, what it should do, and endeavoured to act accordingly. They did not waste their time pursuing elusive chimeras of actual realisations in any field. They conceived Anarchism as a militant struggle for the elimination of present-day oppression and exploitations - beyond their personal immediate need of acquiring knowledge. They were not to be found wasting time to conquer or build labour organisations only to be annihilated by them. They aimed, instead, at always being in the first places of the everyday struggle for the defence of liberty and social justice. The new world could not possibly emerge but from the utter destruction of the old institutions based on privilege and compulsion. He toured the country from ocean to ocean several times, generously spreading the good seed of revolt and Anarchism, and ever leaving behind a deep wake of sympathy, solidarity and enthusiasm for the cause. Again, no formal organisation. From all sides people were doing their utmost to create new regimentations and new burdens for the oppressed multitudes in addition to the old ones. Not he. His purpose was to awaken independent minds, to form solid characters, to give consciousness to stern wills. He has no use for formal adherence to his person, or paper or even ideas. He felt that what the movement needed, above all, were men and women of strong convictions, deeply persuaded that the Anarchist ideal is right, that his paper was giving a genuine interpretation this ideal. He tried to build up such characters and consciences, confiding that, had he succeeded, with or without him the Anarchist movement would have recruited new real forces, a firmer hold upon society than any former organisation could ever give. Once Anarchists had been made, co-operation among them was but a natural inevitable consequence. The doings of such co-operation would almost mechanically spring from the common urge of each and all to action. Here is briefly sketched Galleani's conception of Anarchism as an operating force. A movement of highly consciousness individuals who knew exactly what they wanted and how to go after it, each always in his or her judgement, bound to common action by the singleness of their purpose, co-operating out of a spontaneous impulse and deep conviction that they were acting for the good of the common cause, not for the sake of any discipline - were it even called class discipline. That such a conception was coherent with the Anarchist philosophy is obvious. That it was bound to give good results in practice was proved when the changing circumstances of the American scene brought it to the great test of the struggle against war. Whatsoever one may think of the Anarchist movement in the United States, this much is true: that, as a movement, it suffered less casualties than any other revolutionary movement on account of the war dementia. The socialists fled “en masse” to the patriotic standards of belligerent democracy. Debs remained at the head of but a handful of his former followers. The A. F. of L., prostituted itself to the federal government. The I.W.W. 's tried to attenuate their position, claiming a political agnosticism which was tantamount to overt opposition to the war, lacking only the audacity to affirm itself as such. All the Anarchists, instead, assumed from the beginning a courageous and open stand against the ghastly butchery. Galleani, as usual, minced no words. Persecution soon fell upon him and his paper which was denied the freedom of the mail. Cronaca Sovversiva continued to appear, being distributed by other means. Never had a paper been the object of such a wave of solidarity. Galleani was arrested. The paper found the means to appear just the same. “Nulla dies sine linea” was then our motto: “Not a day without a word” - against the war. Galleani was sentenced by a domesticated federal court in Boston: he would not fold his flag. He was then arrested again together with fifty or sixty comrades who were supposed to receive the paper all over the U.S. and distribute it to the readers. They were all held by the immigration authority for deportation. It was then springtime 1918. He was left almost alone in the printing shop, in Lynn. All the younger comrades were either in jail or hiding. Mr Palmer's hounds ran into the printing shop for the last time, stole the forms of the paper, which had just been issued, and Galleani, a sick old man, whose words the mighty government of the U.S. feared, was silenced at last. The following year, two more issues of Cronaca Sovversiva were published in New York. Galleani toured the country as far west as Kansas. May and June of that year had terrible bomb scares - as is always bound to happen when the freedom of speech and press is suppressed, and on the 24th day of June, Galleani was torn from his wife and children, and embarked for Italy together with eight of his comrades - all undesirable from the great republic of Wall Street. But the American government was to remember Galleani's passage through the American scene for quite a long time. The seeds he had planted on this soil had not fallen on barren ground. The movement he had so prodigally nurtured for so many years remained, however mutilated. And from this movement sprang Andrea Salsedo, who Mr Palmer's assassins threw from a fourteenth story window in New York City, on May 3rd, 1919; from it too came Vanzetti whose seven years martyrdom remains as one of the most inspiring facts in modern times, and as a blot of eternal infamy upon the history of this bloody plutocracy. Galleani's life in Italy was eventful. In 1920 he revived his paper Cronaca Sovversiva only to see it die again after eighteen issues, because the government was after him on account of some objectionable articles, and he had to hide himself to escape preventative arrest. Three days before he was to be tried for this crime, he presented himself to the police, in Turin, and on October 28th, 1922 - the very same day in which the king called Mussolini to preside over the government - Galleani appeared before a jury of twelve good citizens, who condemned him to fourteen months in prison, for the crime of having called the Italian soldiers to the cause of revolution. In prison, his disease aggravated; so, when he was released, over a year later, he had to go to a hospital. Meanwhile the fascist dictatorship was affirming itself. Freedom of speech and press was confiscated. Being unable to resume active work in Italy, he prepared, in 1925, for publication, a little book on Anarchism, which was published by his comrades in America, under the title of La fine dell'Anarchismo? The title: Is Anarchism at An End? suggests the polemical form of the book which is a vigorous defence of anarchist thought against Socialist attacks. Besides this very important work of his, he has left a big volume resuming the chronicles of heroic Anarchism up to 1898: Faccia a Faccia col nemico (Face to Face with the Enemy) and a book of pen sketches: Figure figuri (Men and Mugs), a small volume containing his criticism of the war-like attitude of Kropotkin and other revolutionists, and, finally, pamphlets of various character. Much else of standing value remains to be gathered from the collection of the papers he edited. In 1927 he was arrested and fined because he had received an Anarchist newspaper enclosed in an envelope from America. Later for the same crime, he was again arrested, then sentenced to ten days in prison and, finally, sent to the Island of Lipari, for three years. A few days after he had landed in his new abode, he was arrested, accused of having said evil things of “Il Duce” (Mussolini), and sentenced to six months in the Island's jail. In 1930 he was allowed to leave the island. He took residence in a small village in an Appenine valley and there remained under the continuous surveillance of the police, who never left his housedoor and followed him in his solitary walks by the countryside, to the end of his life, which came the evening of November 4th, 1931. While returning from his usual walk that day, he dropped a few blocks from his home. Taken to his bed by solicitous neighbours - who, although never allowed to approach him, must have sympathised with him - he died half an hour later. As a last outrage, the policeman, who had been following him after his fall, robbed him of his pocket book, which he was known to have in his pocket and which was never found afterwards; and which in the absence of money - as Galleani had always been poor - must have contained tokens of his dear ones living far away and completely unaware of his plight. To the last moment he remained faithful to the ideals to which he had devoted his life. All those who have met him in the various prisons of the kingdom and on the Island bear witness to the unwavering nature of his convictions, the nobility of his character, the generosity of his heart, and undying hopes for the future. A few copies of Galleani's final work, translated as “The End Of Anarchism?” [were] still available from AK Press. We also hope to publish a collection of writings by Galleani in the future.